There are over 1500 active volcanoes around the world, and about 20-50 are actually erupting at any one time. With so many volcanoes across so many countries, how could we possibly choose just 30?? The answer is, with difficulty! 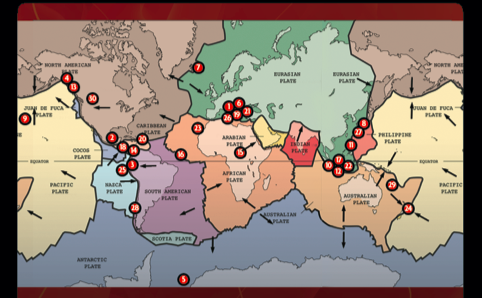 This is the plate tectonic map we have in the card pack. The red dots correspond to the numbers on the cards in the pack.The black arrows show the direction of movement of the plates. It shows the distribution of the top trumps volcanoes: most of them are associated with subduction zones. Can you spot the exceptions, based on the plate movement and their location? We wanted to make sure that the volcanoes we chose were representative of the different styles of eruption, from ones that ooze lava, to very explosive ones. We also wanted to include volcanoes from many different countries, so we’ve included volcanoes from as far north as Iceland, and as far south as Antarctica. We just had to include some of the most famous volcanoes, such as Yellowstone and Vesuvius, but we’ve also popped in a few unusual friends, such as Erebus (Antarctica) and Villarrica (from Chile). 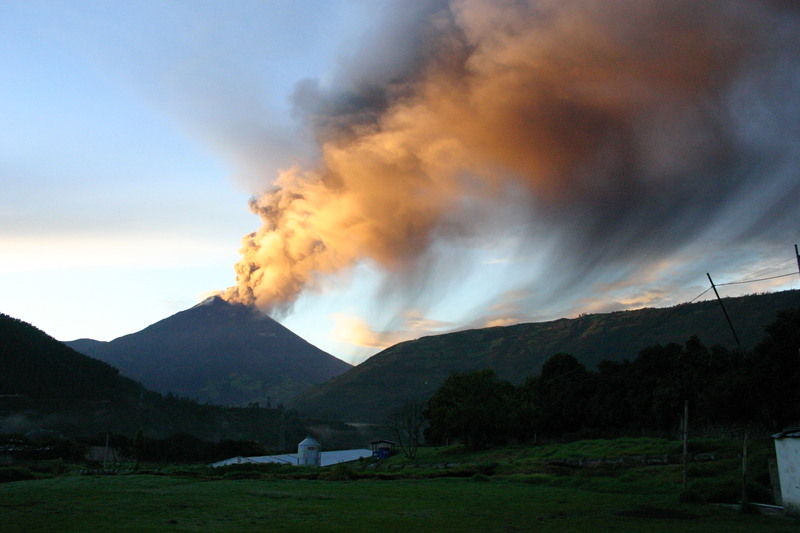 We hope you’ll love finding out about our volcanoes as much as we did choosing them! For some of the volcanoes, we have explained in a little bit more detail what the scores on the cards mean, and have filled out a little more of the what is known of their geological history. You can find these volcanoes in the pull-down menu at the top of this page – and do check back again to see when we have added some more. Let us know if there is anything more that you would like to know about these volcanoes. Sounds great, but how do you leave out MSH?